In addition to all the special projects we undertake for third parties (see also references and R&D), we develop sanitary ware based on special requests from customers and designers. Please do not hesitate to contact us if you have any questions concerning bathtubs, shower trays or washbasin units. 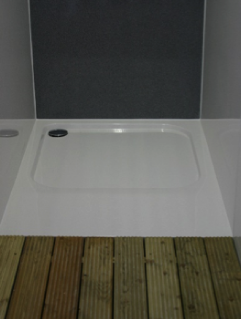 In addition to customised shower tray dimensions (100 x 100 + 40 cm flat), the shower tray has three 5 cm high sides. The glass fibre reinforced wall panels have the same surface quality, ensuring 100% water tightness. The wall panels are 3 mm thick and are suitable for use in newly constructed or renovated bathrooms where the old tiles can be maintained. Our renovation 1800 mm wide shower unit can easily be reduced in width to 1400 mm using a grinder. As a result, an old bathtub in an alcove can easily be replaced by a spacious new shower. 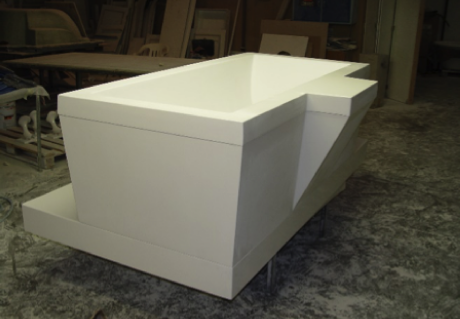 Gutmann has developed a special design that allows us to integrate most of our washbasins in a countertop. 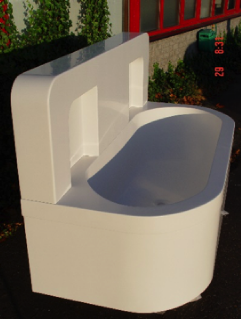 As a result, the customer is free to choose how many washbasins he wants and where he wants to fit them. The width of the counter can vary from 50 to 60 cm. The length is unlimited but the design must be feasible and reasonably easy to fit. Rest assured that no matter how crazy or extreme your project may sound, you can count on us - we have seen it all: projects.